COLUMN: Keep kneeling. It's working. Colin Kaepernick's crusade began in 2016. Red Sox caught stealing signs in latest Yankees-Sox rivalry saga. Bell deserves to be compensated for his skillset. IU beat No. 22 Maryland, but lost its starting first baseman. IU beat Maryland 9-2 in a continuation of a game that began Friday. 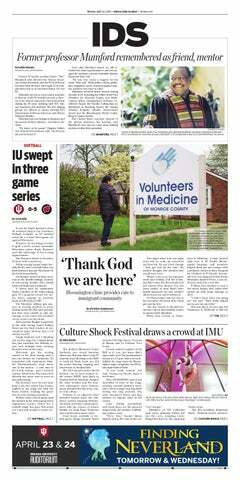 Big Ten leader Maryland is in Bloomington for three games this weekend. For the second time in two matchups, the Hoosiers beat the Cardinals in extra innings. The Hoosiers play the Ball State Cardinals in Indianapolis on Tuesday night. In need of big wins, IU heads to Ann Arbor for three games. IU beat Minnesota 4-0 Sunday to claim the series victory. IU and Minnesota combined for 39 hits Saturday afternoon. The Hoosiers got shutout 11-0 by the Golden Gophers on Friday night. The Hoosiers defeated Indiana State 2-0 Tuesday night in Terre Haute. This will be the first matchup between the teams this season. Matt Lloyd delivers with a solo homer in the 11th to defeat Ball State. Due to a travel curfew, IU and Nebraska tied 1-1 on Sunday. Nebraska beat IU for the second day in a row on Saturday. The Hoosiers lost their win streak after faulty pitching early. IU has now won 10 of its last 11 and bunting has been prevalent in its game plan. The Hoosiers took all three games in Evanston, Illinois and have won nine of their last 10 games.